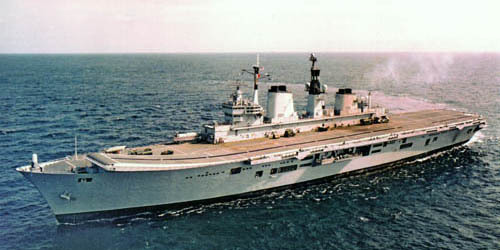 When she was built, Ark Royal was the largest ship in the Royal Navy, being fractionally longer than her sister ships and recognizable by her more steeply angled flight deck ramp. Listed below are the facts and figures relating to Ark Royal V, please let us know of any errors. Length - 210 metres (689 ft). Beam - 35 metres (114 ft). Propulsion - 4 Rolls Royce Olympus Gas Turbines developing a total of 97,000 shp. The gas turbines drive 2 shafts through 2 reversing gear boxes. Electrical Power - 12MW installed capacity provided by 8 Paxman Valenta diesel generators. Armament - 1x Seadart area defence missile system. 3x Phalanx close-in weapon systems. Air Group - 8 Sea Harrier FRS Mk1 armed with air to air missiles, air to surface missiles, bombs and cannons. 9 Sea King HAS Mk5 armed with anti submarine torpedoes and depth charges. Beam - 36 metres (118 ft). Armament - 3x Phalanx close-in weapon systems.